There are many stories floating around about ticks, so here are a few tick facts. Please keep in mind research is ongoing and new discoveries are continually made. Myth: All ticks carry Lyme disease and all ticks are dangerous to humans. Fact: There are about 900 species of ticks found around in the world. Ninety of those species are found within the Continual United States and about eight of these species are known to feed on a host animal that can transmit an infectious blood-borne related infectious bacteria to humans. These blood-borne infectious bacteria can be either Lyme disease, a fever or just a rash, so know the type of ticks in your geographical location within the Unites States and be familiar with the symptoms and treatment. But if you live outside of northeastern and north central US, you have only a 3% chance of contracting Lyme disease. Myth: I only have Lyme disease if I see a red bullseye. False: Some people never get a bullseye but may have flu-like symptoms such as achy joints and muscles, fever, chills or a headache and be aware that not every tick carries an infectious blood-borne related bacteria. Myth: Tick are only found in the forest. False: Ticks can be found in rural or urban areas where there is damp woods, lots of vegetation from overgrown grass or shrubs and along wooded trails. Myth: Ticks fly, jump or are carried by the wind. False: Ticks are very small and patient little creatures whose sole purpose is to feed on a blood meal then reproduce. They tend to stay low to the ground on tall grass or shrubs or in thick leave litter. They sit and wait for a host animal to walk by, then they climb aboard. Myth: Ticks are easy to spot. Fact: The largest tick is the adult female which is about a ¼ of an inch and the adult male is smaller averaging about 3/16th of an inch. 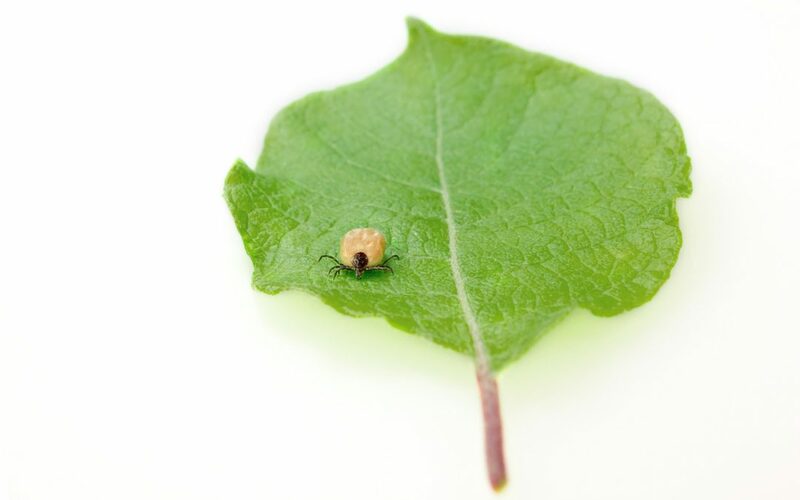 A larva stage tick or baby tick is about the size of a pin head and a nymph or teen tick is about 1/16th of an inch. Myth: Ticks only live in the warm summer. Fact: Ticks can live up to 3 years as an adult and are very active until the first frost then they burrow down below the frost line to try and survive another season. However, most ticks do not live if they do not get a blood meal during each life stage. Myth: I can get Lyme disease from my cat or dog. Fact: There is currently no scientific evidence that pets with Lyme disease can spread the Lyme disease to humans. Myth: To remove a tick I can burn it off or flick it with a credit card. Fact: Use a “needle nose” or fine-tipped tweezer to remove the tick. Grasp the tick as close to the skin’s surface as possible and try not to squeeze too hard you don’t want to snap the head off and leave it in the skin. Begin to pull upward in a slow and steady motion. If you left a piece of head remaining, carefully go back and REMOVE the head. After you have removed the entire tick, clean the area with an antiseptic wipe and monitor yourself for any tell-tale symptoms. Just the Facts: Whenever you come inside after spending some time in a potential tick environment, check your body from head to toe for ticks. If you find one on yourself or family, don’t panic – just remove it. The best way to prevent Lyme disease is to protect yourself. When in a potential tick environment wear light-colored clothing so you can see any potential ticks that may have climbed aboard, pull your socks over your pants legs to prevent ticks from crawling up your leg. Keep your grass cut and get rid of the leave litter piles accumulating around your property. Now go out and enjoy the weather!! !